Kenya's Geoffrey Kirui won the 121st Boston Marathon on Monday, pulling away from American Galen Rupp with about two miles to go to win in an unofficial time of 2 hours, 8 minutes, 37 seconds. Rupp, a three-time Olympian making his Boston debut, was 21 seconds behind and Japan's Suguru Osako was another 30 seconds back. Americans had six of the top 10 finishers in the men's race and two of the top four women. 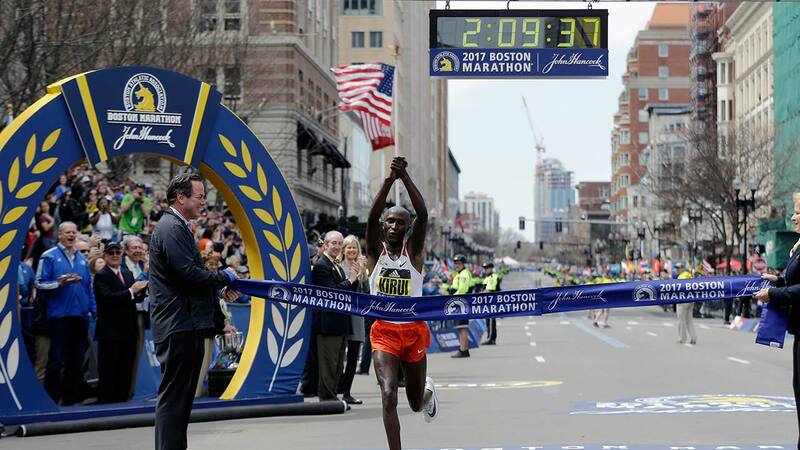 Kenyan policewoman Edna Kiplagat won the women's race in 2:21:52, needing only one try in Boston to add it to wins in London, New York and Los Angeles. She pulled ahead of Rose Chelimo of Bahrain in the Newton hills to win by 59 seconds. "When I was running, my body was feeling good," said Kiplagat, who was greeted at the finish line by two of her children. "I tried to push more, hard and I saw my (rivals) were not picking up the pace." American Jordan Hasay, making her debut at the distance, was third and Desi Linden was fourth - the first time since 1991 that two U.S. women have finished in the top four. The warm temperatures that hit 79 degrees at the 20-kilometer mark in slowed the runners but the strong tailwind was a boost - especially for the wheelchair races. Marcel Hug won Boston for the third time, outpushing 10-time champion Ernst Van Dyk and finishing in 1:18:04 to beat the course record and world best by 21 seconds. Fellow Swiss Manuela Schar shattered the women's mark by more than five minutes, winning in 1:28:17. The winners' times on the point-to-point Boston course are considered a world best and not a world record because of the possibility of a supportive tailwind like the one on Monday. "The wind is so important," Hug said. "The roads were good. Everything was fantastic today." Earlier Monday, city officials announced plans for memorials to mark the sites where two bombs exploded during the 2013 Boston Marathon. City officials and the families of five people who died in the bombing or its aftermath say there's also a plan to build a separate, larger memorial to victims, survivors and responders. Pablo Eduardo is a Massachusetts resident and internationally known sculptor. He'll create the memorial markers on Boylston Street where bombs killed three spectators and wounded more than 260 others. Eduardo said Monday his goal is to "embody the spirit of those we lost and the spirit of the city they loved."